This device is a copier, where the "Telecopier" was a Xerox fax machine. Standard (Group I) at the time was 6 minutes per page. Later the standard changed to Group II and was faster. Not until the advent of digital Group III did we get below one minute per page. The paper used for G-I and G-II was multilayered. A stylus would burn off the top layer, revealing the black layer in the form of characters or pictures, and yes it was kinda smelly. I serviced them for years. 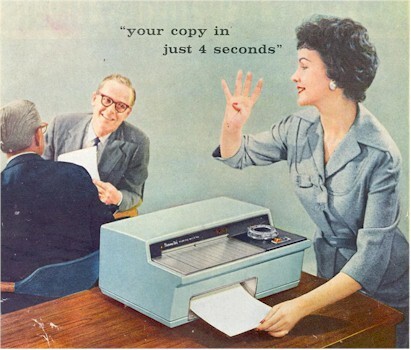 I remember using a device called a telecopier. It took longer than four seconds but it was reasonably fast. The special paper required for receiving smelled terrible.